The Stealth is the flagship of the Frazier range of self-propelled sprayers. It shares many of the well-proven design features of the rest of the range but is fitted with an all new design deluxe cab which sets new standards in self-propelled sprayer design. It has been developed over a long period of time in conjunction with ideas from customers and our own contracting division. Modern computer aided design and manufacturing techniques have been used throughout. The 90hp turbo and inter cooled Ford engine ensures the Stealth can keep up with the work whatever the conditions. The high power to weight ratio means that it is not only well on top of its job but also ensures that there is always plenty in reserve. The 5 speed mechanical transmission system with torque biassing centre differential ensures all available power is transferred to the four driving wheels. The all round suspension and comfortable ride allow the operator to get the most from the Stealth's high working speeds. Outputs are often more than those of bigger and heavier sprayers and when combined with the new generation of low volume nozzles, the work rates have to be seen to be believed! The TDI 2000 is the top of the Stealth range and is fitted with the LandRover TDI engine with a dual range, 4 speed automatic gearbox. This is the ideal powerhouse, with plenty of low down torque, to match the latest Frazier 2,000 litre demountable sprayer. The automatic gearbox provides versatility in even the most demanding conditions. It turns difficult operating conditions into a unique driving experience - the torque converter makes the engine virtually impossible to stall even with uphill starts or when creeping around potato row ends. It also means an end to gearchanges as you accelerate up to the high working speeds that the machine is capable of! The dual range means there are plenty of low gears and a high road speed at low engine revs. For the ultimate in traction a lockable centre differential in the permanent four wheel drive system ensures all the wheels keep turning no matter what the conditions. The ergonomically designed seating position, suspended seat and fully adjustable steering column give new levels of comfort to the operator. The main console, next to the operators right hand, is fitted with a padded hand rest and finger-tip sprayer controls. Miniature joysicks are also at hand to control boom height, tilt and folding. 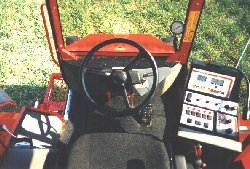 The electronic sprayer monitor, PTO and four wheel steer controls all fit neatly into the adjustable console. Anti-burst vibration mountings, high quality sound-deadening trim and remote hydraulic controls assist in reducing the noise level to below the 76 decibel mark at normal operating speeds. Finishing touches include courtesy light, coat hook, toolbox, somewhere to put the lunch box, and thanks to the cabs large overall size and shape - a passenger seat! Cab access is first class with the new walk-in, flat floor design. 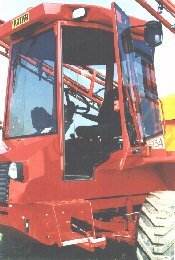 The lower step retracts automatically to reduce damage in tall crops. The lower trim panels are all "wipe clean" and the floor can be swept out with ease. 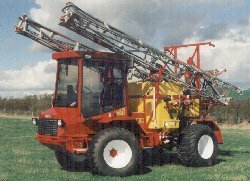 The Stealth will carry any of the Frazier range of sprayers with up to 28m booms. The TCI will carry up to a1500 litres spray tank and the TDI up to 2000 litres. The machine's light weight and even weight distribution over its four driven wheels ensure that it is equally at home as a low ground pressure vehicle as it is when fitted with high clearance wheels.